High-tech tools also require suitable clamping systems in order to achieve perfect results. To ensure that we have the right clamping system available for any tool and any requirement, we offer a wide range of solutions, from drill chucks to conventional collet chucks through to high-performance chucks for industrial applications (shrink chucks or chucks using HSK Plus adaptors) in our standard range. 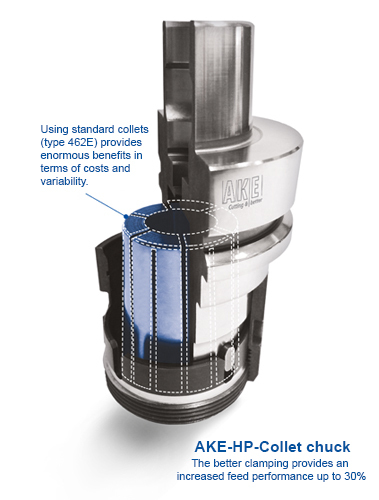 The HP collet chuck from AKE bridges the gap between the flexible collet chucks and high-precision but inflexible shrink chucks used previously. This is possible thanks to an innovative new clamping nut that does not use a ball bearing, in conjunction with a fixed union nut. This provides a significant overall reduction in wear. Many operators want a cost-effective, variable and nevertheless easy-to-use solution for this purpose. AKE has responded to this demand. Initial market analysis showed that there were no products available that could cover the full range of these requirements. The AKE experts therefore decided to develop their own solution to ensure efficient tooling systems. 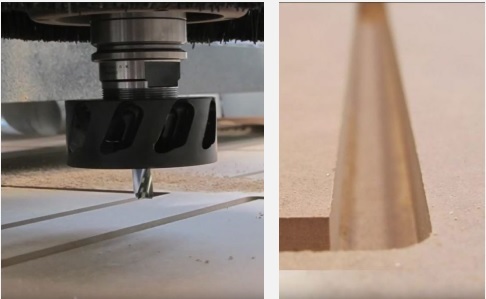 The result is a durable new high-precision clamping system. With this system, the concentricity and feed problems due to damaged ball bearings associated with standard collet chucks are a thing of the past. The AKE HP chuck can achieve a sustainable concentricity of approx. 0.008 mm. Even though its design does not include a union nut with ball bearing, this chuck can be used for both clockwise and anti-clockwise rotation. This feat is possible thanks to the positive-locking design of the new intake nut. There is nothing preventing operators from using standard collets (type 462E) at the same time, providing enormous benefits in terms of costs and variability. The AKE engineers were also able to significantly reduce the diameter, from 63 mm down to 53 mm. The smaller interference contour provides significant advantages in many cases, especially as the new HP generation is also suitable for use at speeds of up to 24,000 rpm. The new HP clamping system provides consistently impressive benefits that can be used effectively: Approx. 40% higher holding force and far better centric clamping provide feed performance increases of up to 30%. These values are the results of in-house testing comparing the HP clamping system to standard collet chucks. In conjunction with the Masterclamp assembly device, AKE is now offering an easy-to-use, high-precision clamping system that can clearly accommodate increased requirements in terms of precision and balance class. The assembly video to the right demonstrates how easy it is to use the Masterclamp in day-to-day work.